Thuong Hoang, Ross Smith, Bruce Thomas, “3D Interactions with a Passive Deformable Haptic Glove”, in IEEE/ACM International Symposium in Mixed and Augmented Reality – Work In Progress,, Adelaide, Australia 2013. Thuong Hoang, Ross Smith, Bruce Thomas, “Passive Deformable Haptic Glove to Support 3D Interactions in Mobile Augmented Reality Environments”, in IEEE/ACM International Symposium on Mixed and Augmented Reality, Adelaide, Australia 2013. 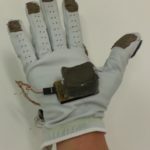 This project explores enhancing mobile immersive augmented reality manipulations by providing a sense of computer-captured touch through the use of a passive deformable haptic glove that responds to objects in the physical environment. 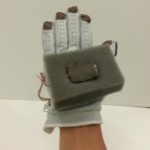 The glove extends our existing pinch glove design with a Digital Foam sensor that is placed under the palm of the hand. The novel glove input device supports a range of touchactivated, precise, direct manipulation modeling techniques with tactile feedback including hole cutting, trench cutting, and chamfer creation. 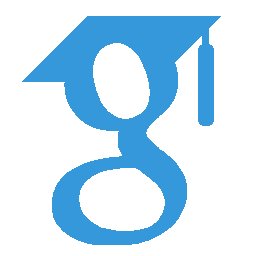 A user evaluation study comparing an image plane approach to our passive deformable haptic glove showed that the glove improves a user’s task performance time, decreases error rate and erroneous hand movements, and reduces fatigue.